This is the top half of the Create/Edit Filter page. Default settings are set to search for all projects in the Active phase (projects currently out for bid), all Project Types, and all Construction Categories. You can select one more phase at a time in the Phase category. Pre-bid phases will include projects currently awaiting release for bid, while apparent lows and contract awards will include projects in the post-bid phase. Under Project Types and Construction Categories your search can be narrowed to show only projects in specific types and categories by checking the boxes next to those that interest you. The fewer types and categories check marked, the more narrow the results. All phases and types are selected by default. We recommend starting with a broad search by keeping “All” check marked. You can always go back later and edit a filter to make it narrower if the results are too broad. 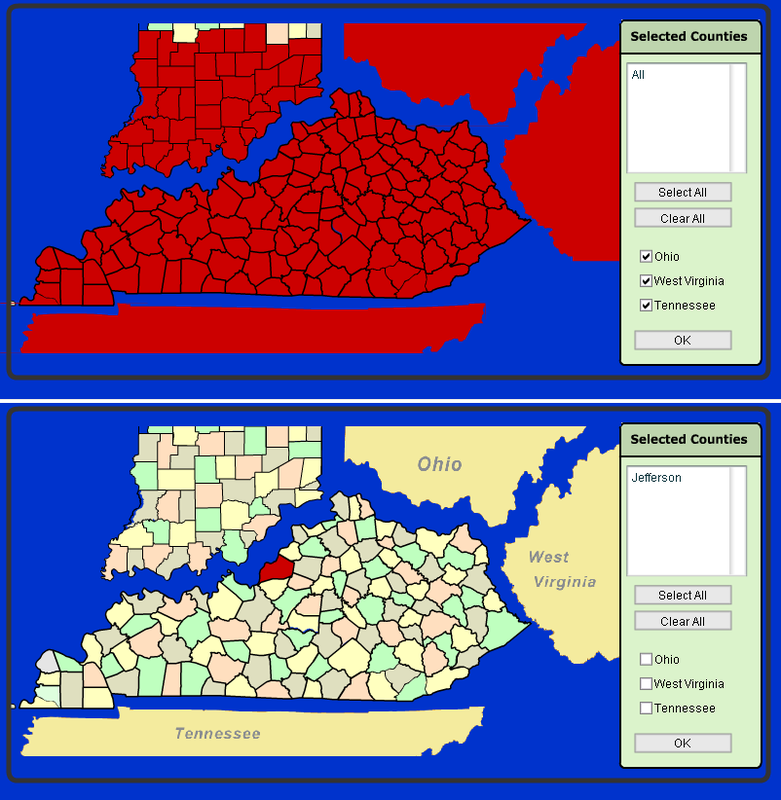 Clicking on Select Counties and/or States will bring up a map in which you can narrow your results to specific regions in Kentucky, Southern Indiana, or the entire states of Ohio, Tennessee, and West Virginia. All regions are selected by default. The top map shows all geographical areas selected. The lower map shows only Jefferson County selected. You can choose to search for projects based on the funding type as well as narrow your search between ranges of total estimated costs. The default setting is “Both Public and Private” funding with no estimated cost range. Finally, there is an option not to “include projects without specs at the end of these search results”. We may be reporting on projects that fit your search parameters but have not yet arrived in our planroom; therefore it is recommended to always leave this option checked. This is the bottom half of the Create/Edit Filter page. 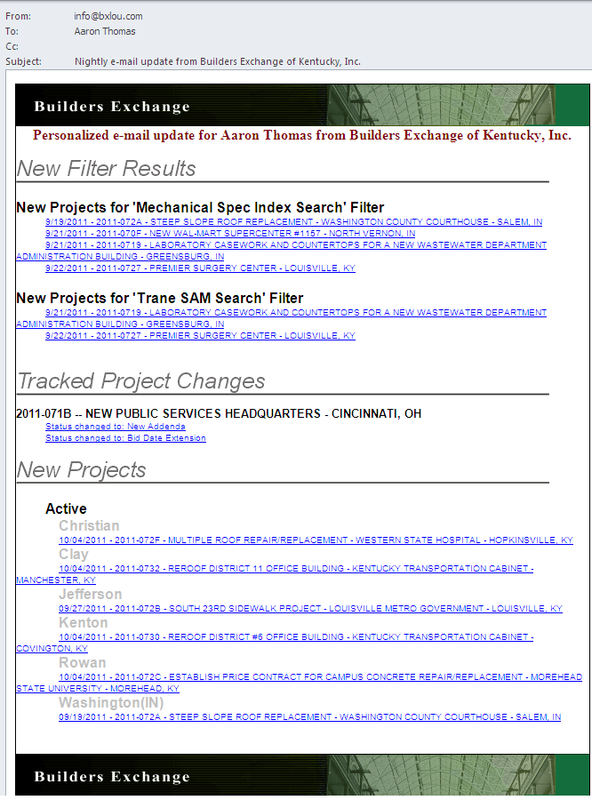 On this page specific keywords, phrases, or trade names can be filtered through in every spec book in the Builders Exchange IPIN System. There are two options available under the purple region and a third option in the red region: a Spec Index Search, a SAM Search (*SAM Search is available only to members with an UPGRADED membership), and a CSI Masterformat Search. I will be focusing only on the Spec Index Search and CSI Masterformat Search in this article. SAM Search will be covered in later articles. 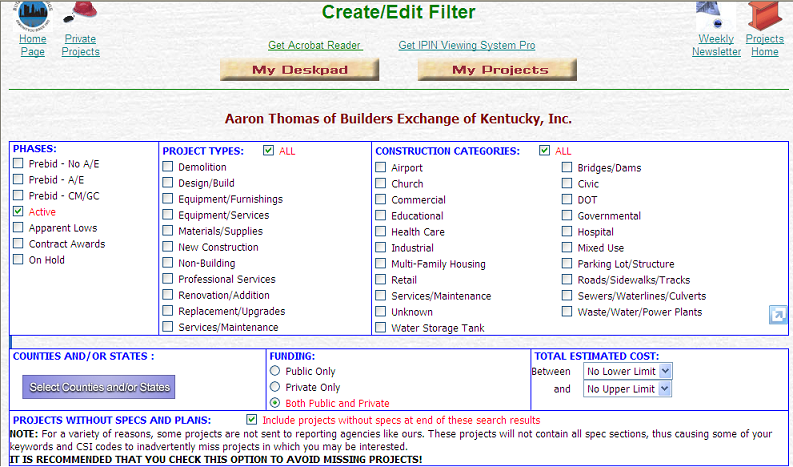 In the example pictured above, all Builders Exchange projects with the words “HVAC”, “mechanical”, and “plumbing” in the spec index will show up in the filter results. The red region beneath the purple keywords region labeled Enter CSI Masterformat Numbers is an additional filter tool. You can use this area to search for specific CSI sections by entering the CSI codes in the bottom red boxes of the Create/Edit Filter page. An asterisk placed after a base number (ex. 15*) will search for all CSI codes starting with the numbers before the asterisks. In the above example, I entered both the “old” mechanical CSI codes (15*) and the newer codes (21*, 22*, & 23*) to make sure my filter shows every spec book that includes these CSI codes. Your CSI codes can change depending on your trade or how narrow or broad you need your filter to be. For example, a filter designed to search only for “Stone Masonry” would include the CSI codes 044300 (Stone Masonry), 047200 (Cast Stone Masonry). 047300 (Manufactured Stone Masonry), and 047313 (Calcium Silicate Manufactured Stone Masonry), while a filter searching for all projects with Masonry sections would input the CSI code 04*. 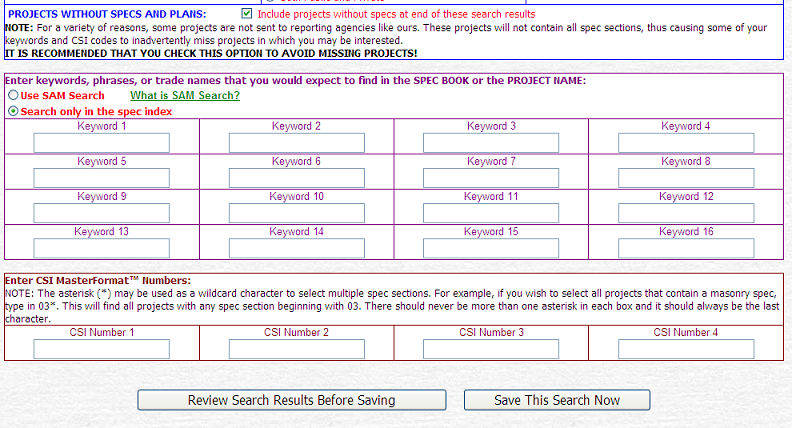 You can use the CSI Masterformat search alone or in tandem with the Spec Index Keyword search. Once you’ve finished setting up your filter, click the “Review Search Results Before Saving” button to test it and make sure it’s finding the projects you want. If you think you’re happy with your filter without testing, click the “Save This Search Now” button. 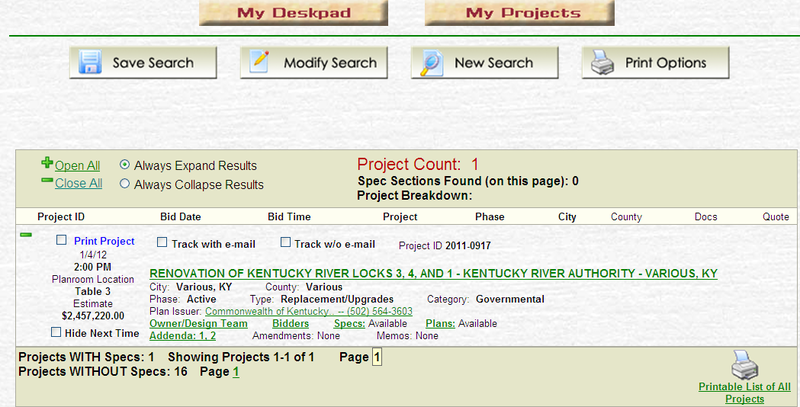 When reviewing search results, you will be redirected to a page showing you the number of projects which “hit” your filter. In the expanded view above (default view is collapsed), you can click on the project name to go to the Project Details page for the project, Bidders to view the bidders list, Specs to view the specifications (*upgraded service required) and Plans to view the plans (*upgraded service required), etc. 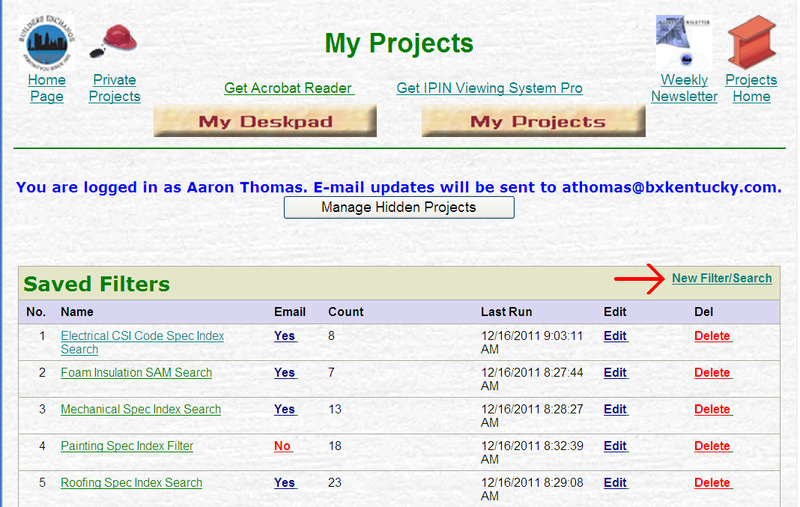 You can also choose to Track each listed project with or without e-mail by check marking the boxes to the left of each phrase or you can choose to hide the project from showing in your results the next time your run your filter by check marking “Hide Next Time” below the cost estimate. If you are unhappy with your results you can click on the Modify Search icon at the top of the page to continue editing and testing your filter before saving. If you’re happy with your results, click on Save Search to save your filter. Enter a name for your search and choose if you would like to receive Daily Email Updates for the filter. Daily Email Updates will send you an e-mail every night which will inform you of any new projects added to the Builders Exchange system the previous day, any changes to the projects you are tracking by e-mail, and any new projects that “hit” your saved filter(s). We highly recommend choosing to receive Daily Email Updates. 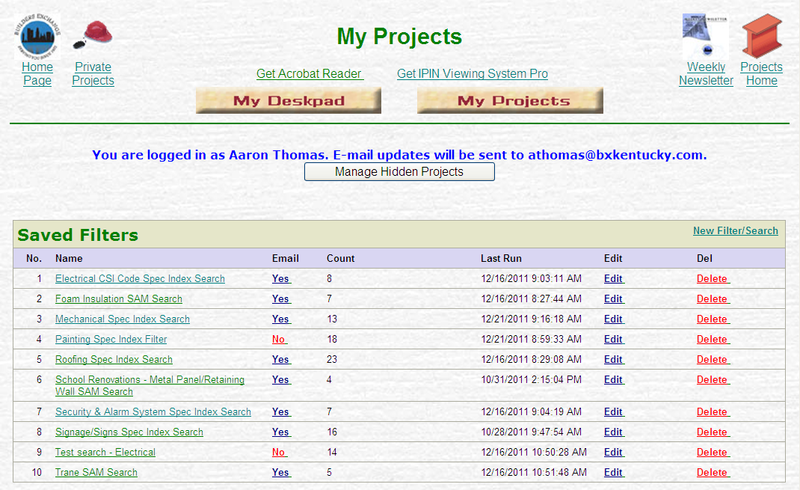 This is the best way to keep updated with any new projects that involve your trades. You can set up and save as many filters as you want. I encourage members to experiment with different keywords and settings to find what works best for your company and trade(s). Our staff is also happy to assist you with setting up your custom filters. Call or e-mail us any time for assistance. The next training sessions will be held on January 27, 2012 (Lexington) and February 17, 2012 (Louisville).